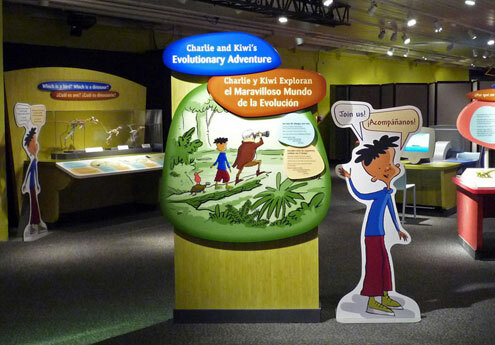 Charlie and Kiwi’s Evolutionary Adventure « Jeff Kennedy Associates, Inc.
On tour since 2009, Charlie and Kiwi’s Evolutionary Adventure is a 1,500 square foot NSF-funded traveling exhibition and research project developed by a partnership of institutions and individuals. 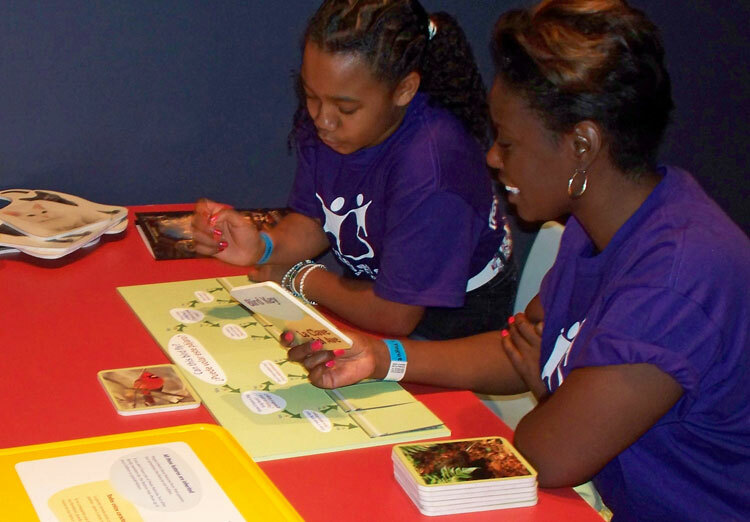 It is based on the work of Dr. Margaret Evans, a University of Michigan developmental psychologist whose research reveals how critical narrative is to children’s understanding of the natural world around them. 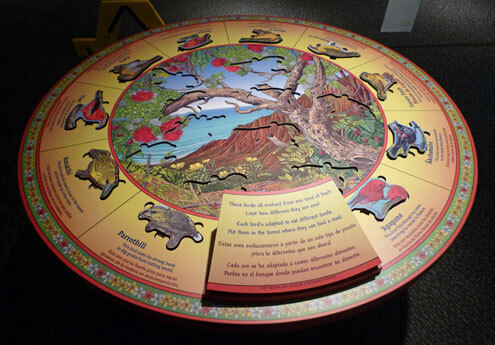 Her findings informed the creation of a compelling story that serves as the exhibition’s central experience, designed to help children make connections between the evolutionary processes that lead to extraordinary changes in the natural world. 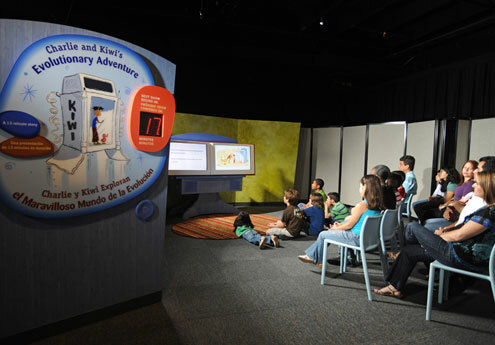 Over the course of the tour, Dr. Evans is using children’s experience with the exhibition as part of her ongoing research. Her early findings indicate that chiildren, particularly those ages 9-12, show greater understanding of concepts underlying natural selection after engaging with the exhibition. The story of Charlie and his stuffed animal sidekick, Kiwi, unfolds in an intimate theater on a giant digital storybook screen. Audiences travel back in time with Charlie, a young boy who is writing a report about his favorite bird—the kiwi—as he explores the age of the dinosaurs to discover the kiwis’ ancestors and evidence for how evolution works. 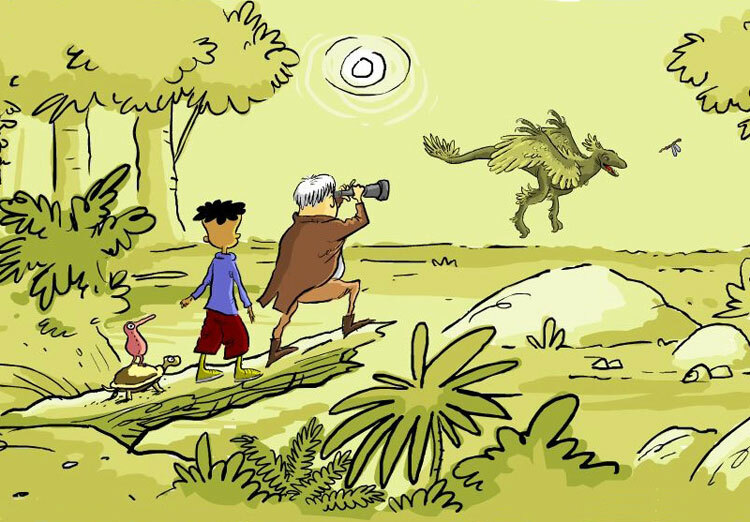 Through the charming drawings of Peter Reynolds, award-winning illustrator of “Judy Moody” and other children’s books, visitors see how Charlie comes to understand the origins of birds and why they are all so different from each other. 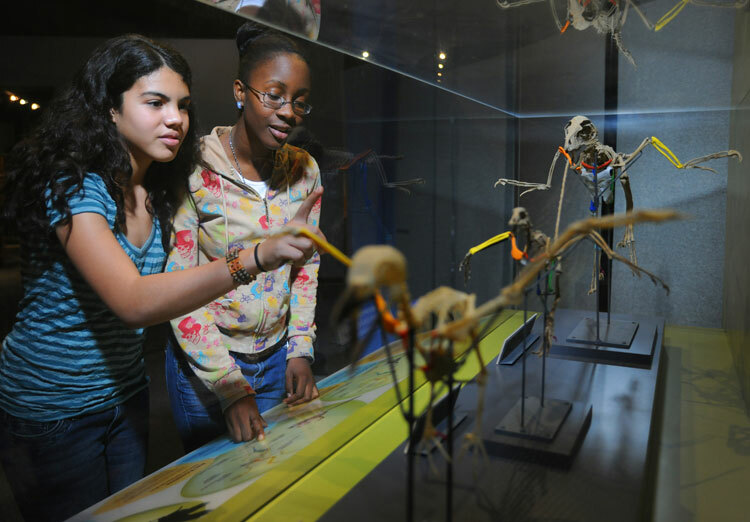 The exhibition invites visitors to see evidence that dinosaurs are the ancestors of modern birds by viewing the homologous bones of a bambiraptor (a dinosaur), an archaeopteryx (one of the first birds) and a modern crow. The breathtaking beauty and diversity of Hawaiian honeycreepers are showcased in a kid-friendly puzzle that underscores how birds have adapted to a variety of environments. A colorful cage full of live budgies draws immediate attention. 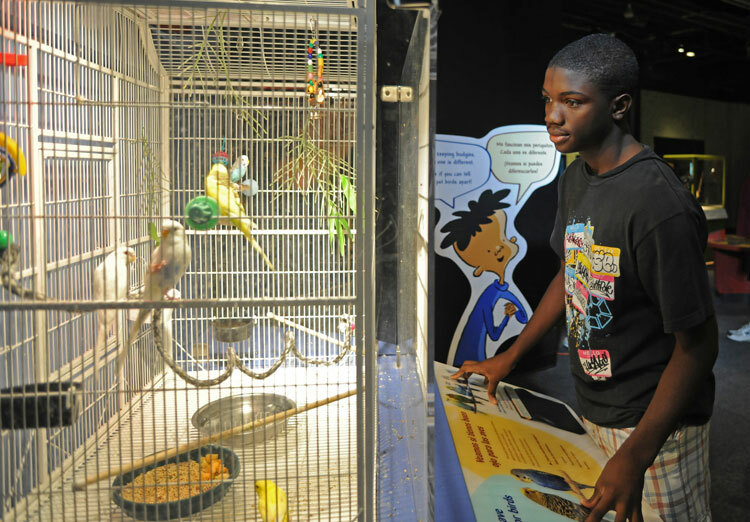 Closely observing the slight differences between the birds by examining the colors, shapes and sizes of their beaks, legs, and feet, visitors come to understand that variations like these in natural populations are the source of evolution by natural selection. Youngest visitors spend time uncovering the fossilized bones of a moa, a flightless bird from New Zealand that became extinct about 500 years ago. 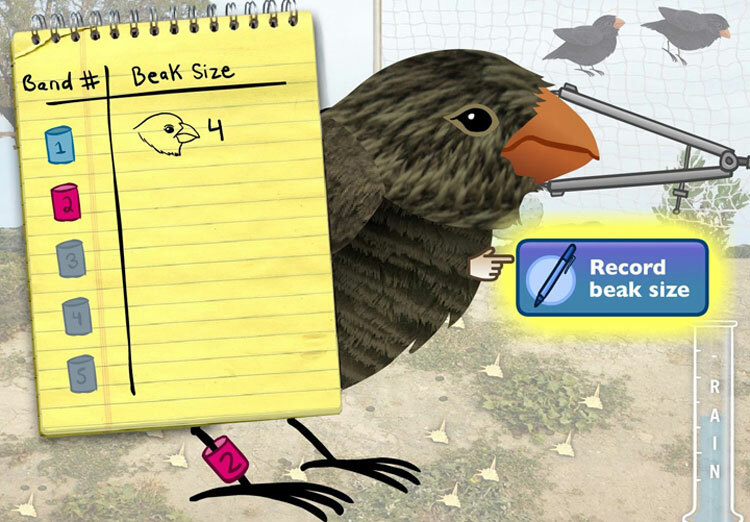 An engaging original interactive lets visitors use calipers to measure the beaks of ground finches on Daphne Major, an island in the Galapagos, recreating the landmark study by Peter and Rosemary Grant that showed natural selection happening in our lifetime. Charles Darwin’s HMS Beagle makes a cameo appearance. 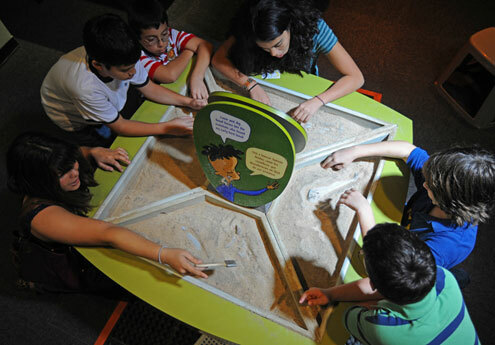 Discovery boxes are designed to let families explore at their own pace. Boxes focus on variation, inheritance and adaptation, three of the key concepts underlying an understanding of evolution.